Cows are considered the most sacred animals. According to Vedic texts, all celestial beings reside in a cow. 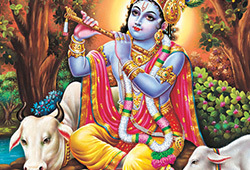 Thus the holy act of feeding the cows is equivalent to feeding all the gods and goddesses. The scriptures say that it is very auspicious to feed a cow and it is one of the most sacred deeds to gain prosperity and happiness. According to Brihat Parashara Smriti, a total of 33 crores (330 million) gods and goddesses reside in the holy cow. Hence, feeding a cow is considered equivalent to feeding the gods themselves. AstroVed has created a new cow donation and feeding Program to give you the opportunity to donate a cow on your behalf and provide daily food and water for a cow on an ongoing basis. Join AstroVed’s initiative to daily provide nutritional support to a cow to invoke divine blessings for you and your family. 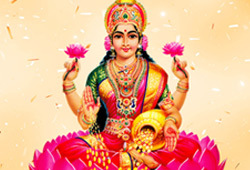 Begin your first feeding on the upcoming Thai Amavasya, one of the powerful New Moon days to satiate the restless souls of your ancestors and seek relief from ancestral afflictions. Select one of our 3-month, 6-month or 12-month package options. 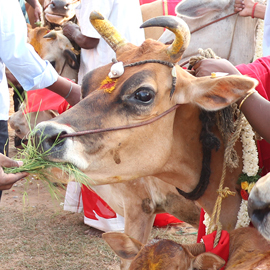 Participate in the holy act of daily feeding a cow to invoke blessings for prosperity and happiness.